The Columbia Fairbanks Omni-Heat was given top marks by numerous reviewers for its remarkable thermal insulation. Droves of patrons were quick to admire this boot’s excessive amounts of comfort. Its superior lightness shocked many users in a good way. On the style front, the Fairbanks Omni-Heat racked up aces from a number of wearers. This Columbia footgear impressed several owners with its glove-like fit. A lot of online purchasers commented that they appreciated its virtually zero break-in period. The traction provided by the outsole of the Fairbanks Omni-Heat from Columbia pleased a considerable number of hikers. According to the majority, it was definitely worth the purchase. An expert was quite critical of the footgear’s laces. He said he had to reconfigure them several times during the boot’s break-in phase. The Fairbanks Omni-Heat’s could-be-better heel pull tab disappointed one professional gear blogger. A few owners were disappointed when water seeped into the boot when traversing melted snow. It would be surprising to like the Fairbanks Omni-Heat simply for the level of warmth it provides. Indeed, there’s no question that this boot from Columbia has thermal insulation in spades; however, it would be quite disheartening if its excellence in the comfort, weight, and design categories is completely ignored. It is rather a shame, however, that some might get turned off by its slick, unruly laces and humdrum pull tabs. Overall, minor complaints aside, the Columbia Fairbanks Omni-Heat is more than capable of delivering greatness, especially on snowy trails. For the warmth, I had these guys out in multiple minus 16 degrees Celsius for 45 to 60 minutes, and I feel that my feet have not been cold once. [Y]ou'll be pleasantly surprised with how light this is compared to other winter boots that you've owned. The Fairbanks Omni-Heat is Columbia’s response to the demands of the trail in cold, snowy conditions. It is capable of sustaining warmth down to negative 25 degrees Fahrenheit, thanks to its Omni-Heat reflective lining and 200-gram thermal insulation. It comes with two Columbia-owned sole technologies: Techlite and Omni-Grip. The former is responsible for stability and cushioning, while the latter offers ample surface grip. 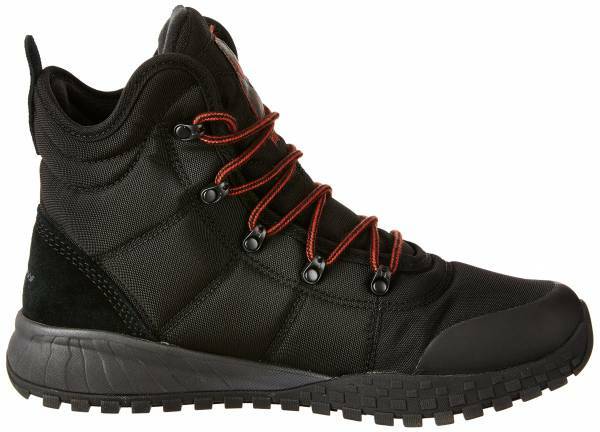 Columbia’s Fairbanks Omni-Heat is a fairly true-to-size, mid-cut winter hiker for men. Its confines favor wearers with regular-width feet. It is offered in full and half sizes. A customized lockdown is possible with the boot’s lace-up closure. Providing a sense of security on the trail with adequate slip and skid resistance is the boot’s Omni-Grip outsole. This non-marking rubber component is engineered with blocky protrusions (also known as lugs) that are capable of producing multi-directional grip on different types of outdoor surfaces, be they wet or dry. Aside from traction, it also offers protection against bumps with its front tip covering a marginal portion of the upper’s forefoot zone. A Columbia-exclusive midsole called Techlite delivers cushioning and footing stability on uneven terrain. It is designed to mitigate shock on impact and give hikers energy return during push offs. On top of it rests a removable footbed for extra underfoot comfort and arch support. The Fairbanks Omni-Heat’s over-the-ankle upper is made primarily of Cordura textile. It shields the foot from the harshness of winter thanks to its thermal insulation (at 200 g) and Omni-Heat reflective lining. Its bootie comes engineered with Omni-Tech—an in-house technology that grants the boot ample breathability and waterproofing. A leather-like overlay strengthens its heel, while a sturdy coating reinforces its toe box. This Columbia boot uses synthetic laces and metallic loops for its lacing system. It is crafted with a heel pull tab to help hikers wear or remove the boot with relative ease. Other winter hiking offerings for the brand include: Columbia Bugaboot III and Columbia Bugaboot Plus IV Omni-Heat.